An array of huge machinery is being installed at the Michoud Assembly Facility (MAF), as the famous New Orleans plant prepares to begin construction of the Space Launch System (SLS). The tooling – one of which is 170 feet tall – will piece together the Heavy Lift Launch Vehicles (HLV) ahead of their launches from the Kennedy Space Center (KSC). With NASA’s new flagship launch vehicle still on track – and with margin – for its 2017 debut, SLS Program managers have begun their Preliminary Design Review (PDR) at the Marshall Space Flight Center (MSFC). 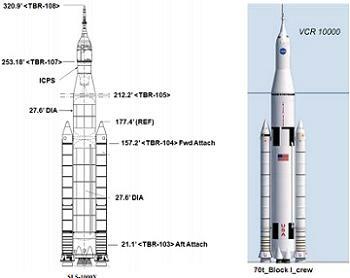 The assessment will allow development to move from concept to initial design, including detailed analyses of the entire launch vehicle – with a large amount of focus on the initial 70mt capable Block 1 configuration and 105mt Block 1A/B versions. “This phase of development allows us to take a critical look at every design element to ensure it’s capable of carrying humans to places we’ve never been before,” said Dan Dumbacher, NASA’s deputy associate administrator for exploration systems development in Washington. The PDR will involve multiple reviews, with Screening and Dispositioning meetings through to the PDR board meeting on July 31. Per L2 SLS PDR information, in addition to the main review there is also a parallel review being conducted by the SLS Standing Review Board (SRB). NASA organizes SRBs for each of its major programs, with SLS’ board scheduled to conclude their findings at the end of July. The SRB will brief the SLS Program on August 21, with the PDR results and the SRB findings to be used to prepare senior level briefings that lead up to a finding that SLS has passed “Key Decision Point C”, or KDP C.
September will involve major briefings to NASA’s top brass, concluding with the overview to NASA administrator Charlie Bolden on September 30. A huge amount of work has already taken place ahead of the PDR, not least during the DAC-2 (Design Analysis Cycle), which began the preparations to begin actual production of SLS hardware, via the creation of thousands of production drawings that will be used by their machine shops to produce the vehicle’s core stage structure. In readiness for the fabrication of the first SLS core stage, six substantial welding tools are being installed into the buildings that gave birth to numerous space hardware, ranging from the Saturn V stages, through to the Shuttle External Tanks and most recently the Exploration Flight Test -1 (EFT-1) Orion. Suppliers worked with NASA and The Boeing Company of Huntsville – the prime contractor for the SLS core stage – over the course of a year to design and build the tools. “One of the challenges that we face in building this large core stage is to develop world-class tooling using modern manufacturing methods in an affordable way, while maintaining the scheduled first launch in 2017,” said Tony Lavoie, manager of the Stages Office at MSFC. As previously reported by NASASpaceFlight.com, multiple projects for the transition of MAF for SLS production are scheduled through 2014, involving modification and construction projects in Buildings 103, 110, 114, 115, 131 and 451. 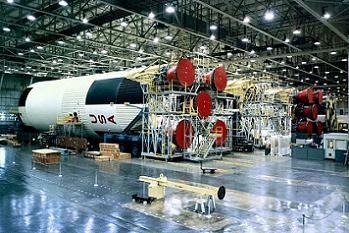 In view of the “last” Shuttle External Tank (ET-94) in Building 103, Michoud’s main manufacturing building – encompassing 42 acres under its roof – has being modified to welcome the Robotic Weld Tool 3. 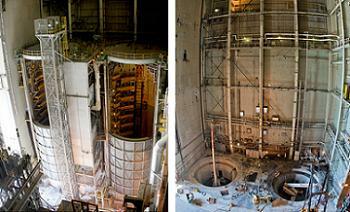 The Circumferential Dome Weld and Gore Weld tools will be used on the RWT-3 to make dome components for SLS. The machine will be known as the Enhanced Robotic Weld Tool when in operation. 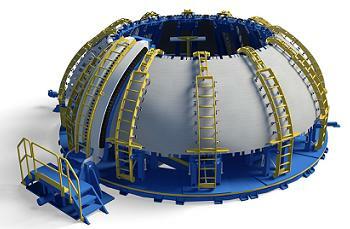 Specifically, the Circumferential Dome Weld Tool will be used to perform circumferential friction stir welds in the production of dome assemblies for the SLS core stage cryogenic tanks, whereas the Gore Weld Tool will perform vertical conventional friction stir welds in the production of gore assemblies – preformed aluminum alloy dome segments – for the SLS core stage tanks. 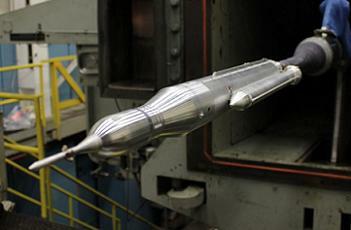 Meanwhile, the new Vertical Weld Center is a friction-stir-weld tool for wet and dry structures on the SLS core stage. This tool will weld barrel panels together to produce whole barrels for the two pressurized tanks, the Intertank, the Forward Skirt and the Aft Engine Section. It stands about three stories tall and weighs 150 tons. The Segmented Ring Tool will use a friction-stir-weld process to produce segmented support rings for the SLS core stage. The rings connect and provide stiffness between domes and barrels. 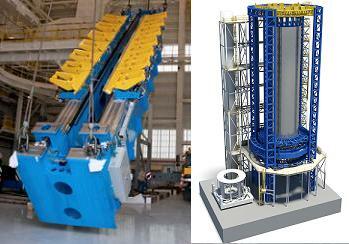 The Vertical Assembly Center (VAC) is another impressive piece of hardware to join the MAF family. Measuring 170 feet tall and 78 feet wide, it is the world’s largest friction stir weld machine and should be installed by March, 2014. The VAC will be where domes, rings and barrels will be joined together to complete the tanks or dry structure assemblies. The tool also will perform nondestructive evaluation (NDE) on the completed welds. “We’re already welding on the new tooling and are gathering information we’ll need to start production welding,” added Rick Navarro, Boeing operations manager at Michoud. “We do a lot of testing, validating and what we call ‘qualifying’ welds that ensure we have all the information we need to build with 100 percent quality assurance. Further articles will follow during the PDR process.